Otakus, have you ever been laughed at or teased for loving animes or even certain characters? Or have you thought of dining in an anime wonderland? 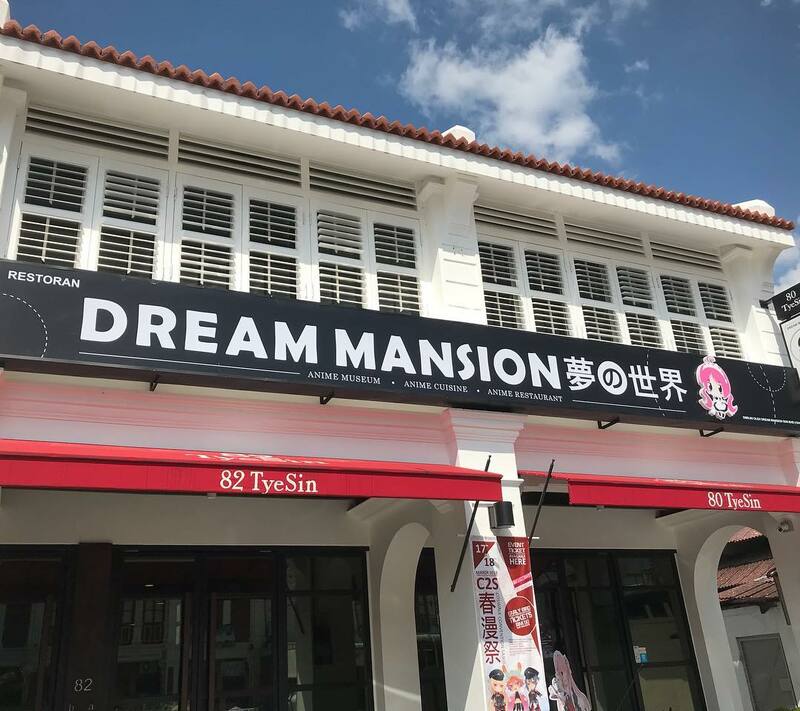 If yes, then Dream Mansion Penang (anime cafe in Penang) would be your magical land. In here, you can dine comfortably and even meet new friends who might have the same interest as you. No one would judge, plus you might get to meet cosplay of certain anime character. Many are sceptical towards themed cafes, thinking that everything is a gimmick and there’s no quality control over food. We thought so too, but Dream Mansion Penang blown our minds, again and AGAIN. Even non-anime fans like us fell in love with this place. Let us walk you through Dream Mansion Penang. Dream Mansion Penang is located at Lebuh Thye Sin, taking two new renovated shop lots, just further down Skynet. From the outside, Dream Mansion looks elegant and clean, with black and white theme. Step into their cafe and you’ll be first greeted with tonnes of action figures like Gundam and One Piece. The interior is spacious, and there are different themes at different corners. The Japanese tatami section, you’ll have to take off your shoes. Experience dining like a true Japanese. The classroom-themed section, this corner is inspired by the anime Assassination Classroom. There’s also a reading corner filled with manga. Alright moving on to food and drinks, our favourite part, and might be yours too because the foods are DAMN GOOD. (Dream Mansion Penang’s chef why you so good please come to our house and cook for us). We ordered the Hot Salted Caramel Macchiato, Iced Blood Chocolate, Strawhat Luffy and Perverted Cyborg. The names are so creative and some of it is inspired by anime. Look at how fancy Salted Caramel Macchiato is, paired with the cute butterfly spoon. Rich, smooth, perfect for coffee lovers. Ice Blood Chocolate looks really scary and bloody, but it’s actually pure milk chocolate with strong milk taste. Perverted Cyborg is berry blended drink, sweet, citrusy and refreshing, best to beat the heat. First dish was Temari Bento, the presentation is 100%, it’s a win. The sushi are rolled into balls, carefully placed into the box, they’re just too beautiful to eat. There’s actually an order on how you should eat the sushi. Start from the top row like radish and cucumber balls (lightest) to the bottom (heaviest). But if you’re a rule breaker (like us) just pick whichever you like, and they’re soo good. The Mentaiko Series. Okakiage is fried fish fillet breaded with rice crackers and nuts, so the texture is extra crispy. Pair them with their Mentaiko sauce, you’ll not stop eating. Mentaiko spaghetti is another bomb, you eat with gold silverware, how atas is that? The highlight for this series, Grilled Salmon with Mentaiko. Beautifully plated, the presentation is no joke, feels like we’re having fine dine. The flavour, fresh, soft salmon grilled to perfection paired with the signature sauce, adding extra kick to the fish. Mapo Tofu might be a Szechuan dish but in Dream Mansion, they’re quite Japanese. You get to choose the spicy level, from 1 to 5, we picked level 3 and oh god, they’re spicy. Yet the flavors are so packed, the sauce and tofu just blend so well with the rice. Last two dishes we swear, we ordered so much we had food coma the other day. Dream Mansion Curry Rice with Grilled Salmon was a hit. The curry is mild yet so flavorful and creamy, the rice is sticky and soft, imagine that. Topped with an Onsen egg and grilled salmon, so good. Miso Ramen with Ebi Fry is another worth trying dishes. Who doesn’t love Japanese ramen to be honest? How can we end our foodventure without desserts? Main highlight of everything, GIANT PARFAIT. Yes you heard it right, it’s a gigantic 12 scoop ice-cream on top of a layer of chocolate pudding,topped with marshmallows, Pocky, strawberries and whipped cream. Amusing isn’t? This is definitely for more than 4 servings but you can challenge it solo. If you could sweep everything within 30 minutes, then it’s free. Can one get food coma by just looking at the pictures and description? If yes, we think you’re having one right now. We know this post is a bit long, but everything is soo DELICIOUS we just have to put all in. Please do us a favour, visit Dream Mansion Penang and tell us your experience. This is 101% genuine review, and if you like more reviews from us, hit us up at Penang Foodie and follow us. Cheers and have a great day ahead! Address: 80&82, Lebuh Tye Sin, George Town, Penang.